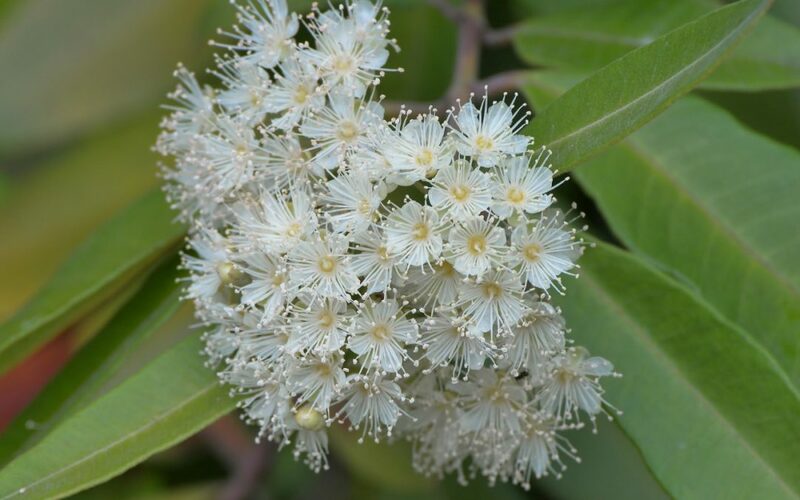 This widely cultivated large shrub or small tree is found naturally in rainforests in Queensland and NSW. The opposite leaves are strongly lemon scented when crushed, making it a very popular bush food plant. The leaves can be steeped in boiling water to make a delicious tea or dried and used in cooking. This is one of the few Australian bush food plants to be grown on a commercial scale, with annual production of 600 to 1100 tonnes. One very large operation in northern Queensland has over one million trees planted and accounts for about 50% of Australian production. Most of the product (leaves or essential oil) is exported to the USA and Europe. In spring the plant becomes covered in heads of creamy white flowers, which attract a wide range of beneficial insects. These are followed by tiny brown dry seed capsules. This is a hardy tree that will tolerate most soils, but prefers good moisture to become well established. In cultivation it typically reaches 4–8 m, but may grow much taller in its natural rainforest habitat (where it becomes a tree with distinctive rough grey bark). It prefers full sun or semi shade and benefits from mulching. The dense foliage makes this an excellent screening plant. Several plants can be grouped and pruned to form a hedge, as can be seen near the railway entrance to the Roma Street Gardens. Specimens can also be seen at the Samford Eco-Corridor (https://www.facebook.com/EcoCorridor). For further information on bush foods, contact the Queensland Bushfood Association (http://www.qldbushfood.org.au/).